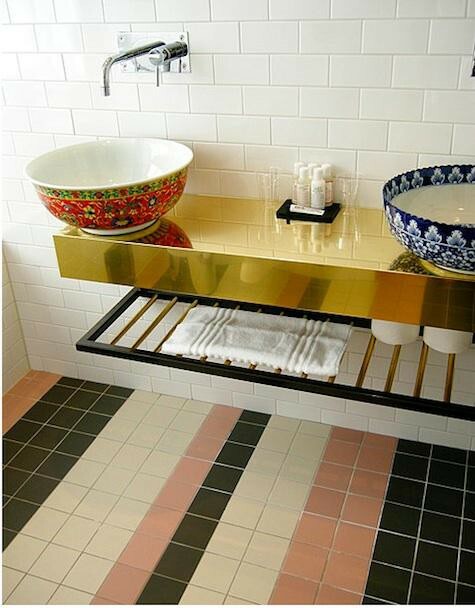 When I saw this photo I nearly flipped at the combo of the gold counter top with these mix matched Asian bowl sinks. This bathroom would look so glamorous if they would just change that UGLY floor tile! Imagine how amazing it would look if they had continued the white subway tiles on the wall to on the floor or if they had picked up a colour from either of these vessel sinks. Such as the beautiful shade of red in the first bowl or the rich navy blue of the second sink. Even a simple black floor or any of the other colours in the bowls such as solid green or yellow would have been fantastic, but this floor talk about yucky! What were they thinking?! I absolutely love the idea of having two different pattern sinks. If you like mix matching, check out this post on mix matched mirrors: here. I agree with you about the floor tiles. Perhaps they could have used a bamboo floor to continue with the Asian theme :). Not sure how it would hold up being constantly wet in a bathroom though. Actually that is an amazing idea! A bamboo floor or tiles with a bamboo look would be the perfect floor design for this bathroom. Great idea! aww thats beautiful! what a great idea! It would be so fun to do a vanity like this. Hope you`re having a great day! LOVE these bowls. If I had my way, I would rather like a whole house dotted with prints and trinkets like these. Like what I imagine the Missoni household looks like! Really like your blog - such a cute original idea! Have a super weekend lovely! Oooo I love the Missoni style too. I once saw photos of the Missoni apartment, it was so colorful & layed back, they even decorated with a ton of stuff like mannequin busts covered in mosaic the Grandma found at a flea market. I found that so surprising.